Great egret grabs aquatic creature at Shark Valley, Everglades National Park, 2016. Frog is among the smaller creatures in the natural habitat of Corkscrew Swamp Sanctuary in Naples, Florida, 2016. Wings outstretched on great blue heron at Shark Valley, Everglades National Park, 2016. 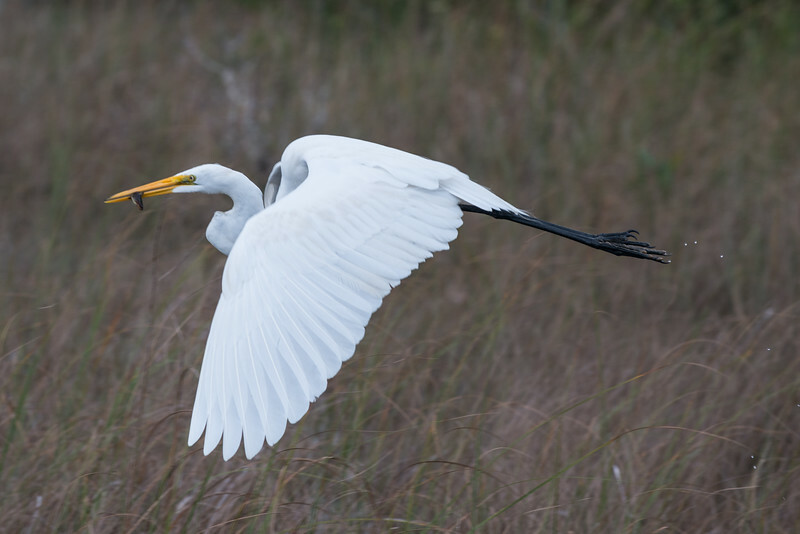 With prey in his beak, this great egret takes flight to find a private dining spot. Notice the water droplets released from the feet and the fan of feathers on the wing. Shark Valley, Everglades National Park, 2016. Shark Valley is filled with these large yet silent predators. If he weren't dangerous, he might be beautiful. Everglades National Park, 2016.